Kevin Burley, president of the Rotary Club of the Bridgewaters, announced the club's annual Exotic Pancake & Yard Sale to be held on Sunday, April 27th from 8 to 11am at the West Bridgewater Senior Center, 97 West Center Street/Route 106, West Bridgewater. Tickets are $6 for adults and $5 for seniors and children under 13. Net proceeds of the event support five $500 scholarships for graduating seniors at the public high school serving students living in the Bridgewaters, namely Bridgewater-Raynham Regional High School, Bristol-Plymouth Regional Vocational High School, East Bridgewater High School, Southeast Regional Vocational High School, and West Bridgewater High School. 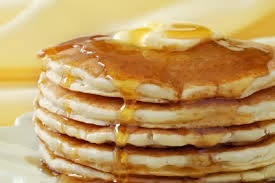 In addition to regular pancakes, blueberry country pancakes, sunny sweet banana nut pancakes, apple cinnamon delight pancakes, tropical pineapple dream pancakes, hot fudge nut sundae pancakes, mayday strawberry surprise pancakes, the breakfast offers glazed cherry baked ham, bacon, sausage, scrambled eggs with or without cheese, coffee, orange juice and fresh baked beans. The Yard Sale will feature many small items of jewelry, sports memorabilia, mens ties, etc., and there will be raffles of various gift baskets and gift certificates from local merchants, as well as a raffle for an arrangement of lottery tickets. Tickets to the event can be purchased in advance by sending a check to Rotary at P.O. 266, East Bridgewater, MA 02333. The Rotary Club of the Bridgewaters was founded in 1970 and has been providing high school scholarships (Community Service Awards) since its inception. The most important part of Rotary is the local club. The Rotary Club of the Bridgewaters meets every Wednesday (except for the second Wednesday when it meets for lunch) for breakfast from 7:30 A.M. until 8:30 A.M. at Good Days Restaurant, 99 South Main Street/Route 28, West Bridgewater, Massachusetts. Each meeting features fellowship, networking, patriotic exercises, a meeting of cheer, often followed by a significant speaker from business and/or the professions. The members of the club carry out local service, primarily funding: Scholarships to graduating seniors at East Bridgewater High School, Bridgewater-Raynham High School, West Bridgewater High School, Southeastern Regional Vocational Technical High School and Bristol-Plymouth Regional High School; Dictionaries or thesauri for third graders; Books for Kids at Public Libraries; Boy Scouts; Girl Scouts; East Bridgewater Family YMCA; Natural Resources Trust of Bridgewater; Rotary Youth Leadership Award (RYLA); West Bridgewater Gazebo Concerts on the Common. It carries out International Service: Working for Peace - Working to Eliminate Polio in the World - Supporting Literacy in South Africa - Working to teach reading where there are no schools - Working to provide clean water for every living person - Providing wheelchairs where they are needed - Providing Shelter Boxes for people affected by natural disasters.